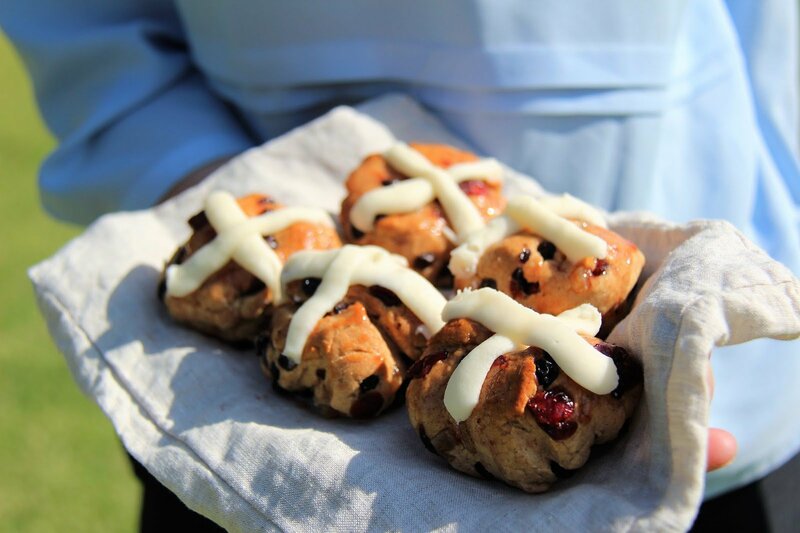 In many countries, hot cross buns are a delicious must for Easter time. Despite this recipe being a bit time consuming you can enjoy these tasty low FODMAP buns that still have a truly traditional flavor. Enjoy, and have a happy Easter! 1.Warm milk until it is luke-warm stir in yeast to activate (it should dissolve and bubble). Set aside for5-10 minutes. 3.In a large bowl mix flours (sifted), sugar, xanthan gum, salt and spices. Make a well in the centre and incorporate milk and yeast mixture, butter and egg, mix with a wooden spoon, a dough mixer or your hand to a cohesive and slightly sticky dough. Note: this does not need to be kneaded. 4.Place the dough in a large, lightly oiled bowl and cover with lightly oiled plastic wrap. Leave the dough to rise in a warm place for 1-2 hours or until doubled in size. 5.Mix the fruits and peel with the extra maize flour, breaking up any clumps. 6.Knock back the dough and re-oil the bowl and your hands. Sprinkle the over the dough and work together until the mixture is evenly incorporated. 7.On a lightly oiled work surface pat out the dough into a log (~4cm diameter) and cut into 12 even pieces (~85-90g each). 8.Prepare an oven tray with baking paper and roll dough portions into balls, place evenly on the tray leaving 1cm between each. 10.Preheat oven to 180°C. For better results, place a deep baking tray half full of boiling water on a rack near the bottom of the oven to provide some steam. 11.Bake the buns for 20 minutes, or until golden brown. Place the hot buns on a cooling rack and glaze whilst they are still hot. 1.Melt the butter and add to the icing sugar. 2.Gradually add the milk using a fork to achieve a cohesive but stiff icing. 3.Place icing in a piping bag fitted with a small nozzle on the just cooled buns. Alternatively, use a snap lock bag and snip a tiny corner off to create a 2mm hole to pipe the icing.